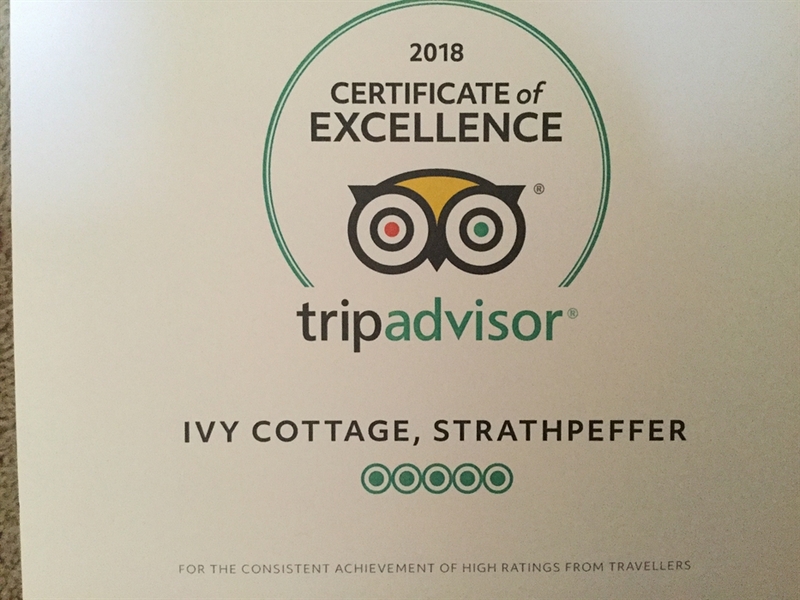 Ivy Cottage Heights of Brae Strathpeffer Ross-Shire. Inverness 15 miles , Dornoch 30 miles, Gairloch / Ullapool 40 miles. Ivy Cottage is a cosy Highland croft house set above a working croft on the hillside between Dingwall and Strathpeffer at the foot of Ben Wyvis. The cottage has stunning panoramic views from the Grampian Mountains to the east across the hills to the south and west with Ben Wyvis to the North. Renovated and re-decorated to a high standard in February 2011 the cottage is fully centrally heated and has a wood burning stove in the living room adding to the traditional feel. The fully enclosed garden has a picnic bench and garden seat which allows you to relax outside and catch a glimpse of the local population of red kites swoop down on the croft to feed most days. Black grouse, golden eagles, red deer and roe deer can be spotted in the hills up above the cottage. At the bottom of the croft is a tourist viewpoint and memorial to the famous novelist Neil Gunn. If its peace and tranquillity you want from your Highland break then step out the back door and walk for miles on end enjoying the wildlife and you are unlikely to meet another human being. A 5 minute drive or 30 minute walk west will take you to the historic Victorian spa village of Strathpeffer with its vast array of hotels and restaurants or turn east to arrive in the bustling market town of Dingwall with its swimming pool, supermarket and food takeaways. If you are on a golfing break then the challenging Strathpeffer hillside course is only a 5 minute drive away and at least 10 golf courses are available within a 30 minute drive including the Castle Stuart course. Should you want to fish then stocked lochs are available within a 15 minute drive and permit fishing for brown trout and salmon is available throughout the locality. Sea fishing trips are also available from both the east and west coast. There are also 5 whisky distilleries within a 30 minute drive of the cottage which do regular visitor tours. Loch Ness, and the Culloden Battlefield visitor centre is only a 30 minute drive away and the Moray Firth with its dolphin population is only 25 minutes away. Pets are not allowed in the cottage however dogs can be accommodated in an outhouse complete with run subject to them being kept under control at all times as sheep and cows graze nearby.